Ready for a weekend read? 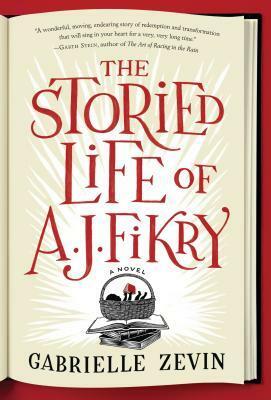 Over the past weekend, I started and finished The Storied Life of A.J. Fikry by Gabrielle Zevin. This book came highly recommended by NPR and is the April book selection for shereads.org‘s book club. A.J. Fikry is a bookseller on a remote fictional island called Alice Island, somewhere near Boston. He is a loner and an intellectual, but he is about to realize that his “no man is an island” theory on books actually applies to all of life. Through many sharp ups and downs, Fikry’s life becomes quite remarkable. This was a fast read, and not really what I was expecting. It is nothing like The Guernsey Literary and Potato Peel Pie Society, though goodreads.com makes that comparison. The biggest pro for me from this book was the book talk. If you’re a fan of the short story, you’ll probably like this book even more than I did, as each chapter begins with a short story synopsis and A.J.’s thoughts on what he thinks are the best short stories of all time. Beyond the many references to literature, A.J. Fikry had several cons in my reading philosophy. Con #1 – A.J. Fikry is a prickly character that I don’t feel much empathy for at the beginning and my sentiments towards him don’t change as much as they probably should as he evolves through the novel. Con #2 – While I’m thankful there are no graphic descriptions, the development of romantic relationships between characters begins with the physical side of romance. Con #4 – There’s a general feeling of meaninglessness instead of hope, as if The Universe is at war against the characters for some reason that no one can know and that no one tries to discover. One quote in particular stands out to me from the end of the book (not a spoiler, FYI): “I love Island Books [Fikry’s store] with all my heart. I do not believe in God. I have no religion. But this to me is as close to a church as I have known in this life.” When you read that at the end, knowing what the characters have been through, even a book lover like me (who sheds real tears when a bookstore closes) can’t help but sensing there’s an emptiness to the meaning of life presented in the book. Getting beyond the cons, The Storied Life of A.J. Fikry has a comfortable narration style, a few lovable characters, and will be a favorite for readers who enjoy literary fiction. I thought this book had a lot of similarities in style to The Time Traveler’s Wife. It also has the feel at some parts of a The Fault in Our Stars for grown-ups. I wouldn’t give A.J. Fikry more than three stars, but as Levar Burton says, “Don’t take my word for it.” I think it’s a book lots of people will love, and it’s an easy weekend or beach read that won’t feel like a waste of time, whether you end up liking it or not.